Mutual funds form that pool of investment where the funds invested by you are managed by professionals or those that are tracked by an index. The funds are diversified in their investment choices to offset the risk of potential losses. How is SIP Better than Lump sum? Mutual funds are investment platforms managed by professionals who invest in securities like stocks and bonds, money market instruments and commodities like precious metals. These funds invest across a diverse class of assets keeping in mind the objective of the investment. You may start with a comparatively small sum of money in mutual funds where finance professionals manage your fund. This is an attractive means of savings that also offers high growth prospects. 2. How Do Mutual Funds Work? Mutual funds have a simple process to their working. As an investor you invest in a mutual fund company which is also collecting similar investments from other individuals as well. The fund thus created is managed by finance professionals with extensive experience and knowledge of the financial market. The aim of the fund management is to achieve growth through strategic investments. Based on the amount you invest, you will get units of the mutual fund and the Asset Management Company will manage your investment by investing in various schemes that are operated by the mutual fund. The mutual fund house also provides services like financial consulting, advisory, customer service, marketing, accounting and sales functions, etc. for the schemes. SIP or a Systematic Investment Plan is smart tool for investing that is simple and hassle free. You can start by investing a certain amount of money at a regular interval say weekly, monthly or quarterly. This planned process of investing helps in building discipline as well ensures a future of wealth building. It is particularly good because of its flexible feature. The investment amount is auto debited from your bank account and invested in mutual fund schemes. With each instalment of investment that you make, additional units of the schemes are bought at the prevailing Net Asset Value (NAV) and adds on to your account and profile. You get the benefit of Rupee Cost Averaging and the power of compounding. 4. How is SIP Better than Lump sum? Systematic Investment Plans are often considered better than lump sum investment but it is interesting to note that there is no hard and fast rule to this fact. The point to note is that SIPs in most cases over the longer course of time have fared better than lump sum investments. Since these are periodical investment funds of a fixed sum and frequency they have two main benefits. Since SIP entails a fixed sum investment at regular intervals regardless of what the market situation is, investors tend to automatically buy more units when the market is at a low. This leads to lower average price translating to higher returns. With lump sum investment you are faced with the market at a certain cycle where the market rates may or may not be low. Having the advantage to invest at an average price over a course of time makes SIP a better option. Another reason why SIP may be the better of the two investing types is very directly related to our human nature. We tend to invest more when the outlook seems brighter and start selling when things don’t look too good. SIPs do just the contrary by automating the process of investing regularly thereby removing the notion of deciding when to sell and continue to invest in leading to better returns. 5. Why Invest in Mutual Funds? 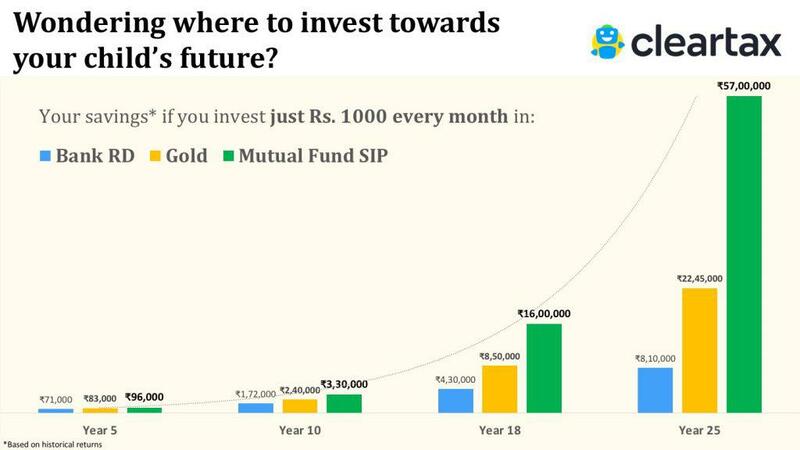 Investing in SIP is a great way of achieving your long-term as well as short-term financial goals. One good reason why you must invest in this format is the habit of saving and investing it inculcates in one. It is a very disciplined approach to investing. Not to mention SIP also reduces the risk pertaining to equity fluctuations. More information on SIP you can visit ClearTax and choose from a selection of handpicked plans that best suit your budget to meet your financial needs. Following are some of the best SIP options that investors can look at. The funds shortlisted here are based on 5-year returns, dated June 2018. Remember, investing in mutual funds is subject to market risk and requires careful consideration prior to investing. ClearTax does not endorse any of the funds.